Monster High DEAD TIRED Draculaura Doll + JEWELRY BOX Coffin Bed Furniture Set! (OPEN BOX) Monster High Coffin Bean & Clawdeen Wolf Doll Playset FREE SHIPPING. Monster High Ghouls Rule Clawdeen Wolf Doll - NEW & SEALED! 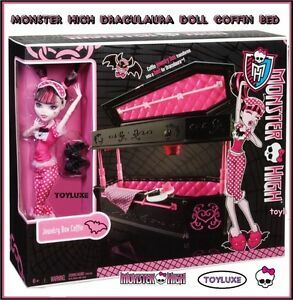 This is just as described - a Monster High Draculaura Doll in cute pajamas, along with a coffin bed. Cute black slippers, a journal, pen, mini tea cup and saucer all accessorize this set perfectly. Thank you! Great Set!! Adorable!! My neice LOVED it! !